Experience tells us that any enduring change requires a systemized approach. 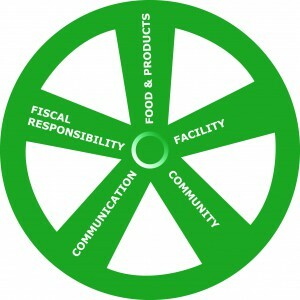 Imagine a successful Sustainable Food Program as a wheel with five spokes. If we want that wheel to effectively perform to its optimum potential (and roll on to success), it requires that all five spokes work collaboratively. If one or more spokes are neglected the entire wheel will suffer. When all areas are systematically addressed the opportunities are endless.